Before the interim agreement with Iran there was a case for saying that Obama was in danger of going down in history as one of the least effective and worst presidents America has had. It’s now possible that he’ll have the opportunity to become a real peacemaker and go down in history as one of America’s greatest presidents. Also in my mind as I write are the words of Israeli Prime Minister Netanyahu when he was denouncing and rejecting the interim agreement with Iran. “Today the world became a much more dangerous place because the most dangerous regime in the world has made a significant step in obtaining the most dangerous weapons in the world.” This, about a country which does not possess nuclear weapons and doesn’t want them, from the man whose state possesses hundreds of nuclear warheads and tactical battlefield nuclear weapons. No, Mr. Netanyahu, while it is led by you and/or your kind, Israel has the most dangerous regime in the world. A recent Kevin Barrett article was headlined Iran Deal Fallout: Top Ten Ways Netanyahu Will Try To Sabotage Peace. One of the ways was “Announce that earth is under invasion by aliens and that Iran is on the side of the aliens.” That made me smile but with Netanyahu anything except peace on terms the Palestinians could accept is possible. And what about those who to date have been most prepared to do Netanyahu’s bidding? In theory Israel’s stooges in the U.S. Congress, if they commanded a two-thirds majority, could override a presidential veto on imposing tough new sanctions on Iran for the purpose of wrecking the prospects of a final agreement with it. The question is – will they dare to do it in the next six months? My speculation is that they will huff, puff and threaten but won’t actually do it. Why not? If they did they would expose themselves like never before for what they really are – not merely stooges of the Zionist lobby, AIPAC in particular, but agents acting against America’s own best interests and therefore traitors. Not long ago the proclaimed view of some American supporters of Israel right or wrong was that Obama was throwing Israel under a bus. The idea that American Jews should now throw Netanyahu under it appeals to me, as I am sure it does to Obama. If Congress does back away from doing Zionism’s bidding to wreck the prospects for a new-start American and European accommodation with Iran, what options if any will Netanyahu’s Israel have to distract the world’s media and political attention from Zionism’s on-going colonization – ethnic cleansing slowly and by stealth – of the occupied West Bank? Only one that I can see. War. Amidror’s stated position, like that of his former master, is nonsense – perhaps disingenuous is a more appropriate term – because there is no Iranian military threat Israel will have to defend itself against. (As I have noted in previous articles, even if Iran did posses nuclear bombs, no Iranian leadership would launch a first strike against Israel because doing so would result in Iran being devastated and quite possibly wiped off the face of the earth). And that’s why I remain, on balance, convinced that Netanyahu’s implicit threat to go it alone with an attack on Iran is a bluff. But that said there is actually no telling what Netanyahu might do when trapped in a corner of his own construction with no way out. Question: Why do I believe Netanyahu’s assertion that Iran is a threat to Israel’s existence (when it isn’t) is Zionism’s last card? My answer is not complicated. From the moment of Israel’s creation mainly by Zionist terrorism and ethnic cleansing, Zionism’s guiding strategy has been to present and have Israel perceived in the Western world as the VICTIM when it was and is the AGGRESSOR and OPPRESSOR. In the context of Jewish history, Zionism’s calculation was that so long as Israel was perceived in the Western world as the victim, it could do what it liked to impose its will on the Palestinians and the whole region in the name of “self-defense”. For most of the second half of the 20th century, and thanks in large part to the mainstream media’s refusal to come to grips with the truth of history, Zionism succeeded in getting its lie accepted as truth. (I say “lie” without fear of contradiction because, as I document in detail in my book, the Arab regimes never, ever had any intention of fighting Israel to liberate Palestine). So, conned into believing that Israel really did live in constant danger of annihilation, the “driving into the sea” of its Jews, most people in North America and Western Europe were content to go along with the notion that whatever Israel as the “victim” did to protect itself was understandable and acceptable. But with time, as the truth began to trickle out and nuclear-armed Israel demonstrated that it was the region’s military superpower which could defeat any combination of Arab force, the perception of Israel being in danger of annihilation began to fade, and its leaders, Netanyahu especially, realized that they needed a new enemy if they were to maintain the fiction that Israel was the victim. It has to said that Netanyahu’s effort to sell the idea of Iran as a threat to Israel’s existence was assisted by some stupid rhetoric from President Ahmadinejad though, to be fair to him, he did not say, as the mainstream Western media still insists that he did, that Israel should be “wiped off the map”. That phrasing clearly implies that he wanted to see all Israeli Jews slaughtered. What he actually said was that he wanted Zionism to disappear as the Soviet Union had done – i.e. without violence, peacefully. Put another way, he was saying he wanted to see Palestine de-Zionized. In reality there was absolutely no implication in what he said that Israeli Jews should be sent packing from Palestine or killed. (One of Ahmadinejad’s problems is that he did not know how to talk to the West, and as a consequence he had no idea of how what he said could and would be twisted and misrepresented by Israel’s leaders). In summary, the alleged Iran threat is Zionism’s last card because there is no other enemy it could present as a military threat to Israel’s existence in order to justify its criminal policies and actions in the name of self-defense. Though events may prove me wrong, my overall speculation is that Zionism’s last card is not a winner and that Obama will succeed in getting, six months or so from now, what he wants – a new-start and mutually beneficial relationship with Iran. And defeat for the Zionist lobby will, as I indicated in my opening paragraph, free him to use the presidential leverage to try to oblige Israel to be serious about peace on terms the vast majority of Palestinians could accept. In my view the best way for him to make a start down that road if and when the time comes would be to say publicly to Israel and all Jewish Americans what President Kennedy said privately to Golda Meir when he was suggesting to her by obvious implication that she and her leadership colleagues should dump Ben-Gurion as prime minister and have him replaced by Levi Eshkol. (That much happened as Kennedy wanted, and if he had been allowed to live he was planning very early in his second term to invite Eshkol and Egypt’s President Nasser to the White House for peace talks). At the time, and with the help of the Zionist lobby, Ben-Gurion was blocking Kennedy’s efforts to prevent Israel possessing nuclear weapons. IN OTHER WORDS, KENNEDY WAS SEEKING TO PREVENT ISRAEL ACTUALLY DOING, FOR REAL, WHAT ISRAEL IS FALSELY ACCUSING IRAN OF DOING! To give readers of this article something of the full flavour of what Kennedy said to Golda and the considerations which made him say it, I am now going to quote two and a bit pages from Chapter 11 of Volume Two of the American edition of my book which is sub-titled David Becomes Goliath. The title of the chapter is Turning Point – The Assassination of President Kennedy. The conversation between the young president and the aging Mother Israel took place on 27th December 1962 on the veranda of the Kennedy holiday home in Palm Springs. The only other person present to keep a note of what was said was Philips Talbot, an assistant secretary of state for Near Eastern Affairs. He had he been relieved the day after Kennedy entered the White House to get a message from the new president saying that although he had received nearly 90 percent of the Jewish votes, he was “not in their pockets”. For his part Kennedy really trusted Talbot. Only selected parts of his eight-page memorandum of the conversation were de-classified in 1979. Some of what he wrote was deleted and some remains classified, for which read suppressed, to this day for “security reasons”. (Ha! Ha!). The text I am quoting and the whole chapter from which it comes begs the question of how different the history of what used to be called the Arab-Israeli conflict might have been if Kennedy had been allowed to live and serve a second term. President Kennedy’s message to Golda was to the effect that he was ready, willing and able to give Israel an irrevocable commitment that America would guarantee Israel’s security and survival, but that the giving of such a commitment was conditional. The U.S. could not and would not give it to a nuclear-armed Jewish state. Israel had to agree to IAEA inspection of Dimona and if that proved, as he suspected it would, that Israel was in the process of producing a nuclear bomb of its own, work on the project would have to be stopped. Terminated. And… if that meant Golda and her colleagues getting rid of Ben-Gurion, they should do it. That was not, of course, how President Kennedy would have put it. No American President could have spoken in such terms, even in private on the secluded veranda of his holiday home. But it was the message Golda could extract from what he did say to her; and he knew she was more than smart enough to do the extracting. The idea of America “pulling out” of the Arab Middle East was not on anybody’s public agenda, so why did President Kennedy feel the need to talk about it? The implication is that he was under mounting pressure from the Zionist lobby and its stooges in Congress to abandon Eisenhower’s policy of even-handedness, and to look upon Israel as America’s only true friend and reliable ally in the region. Though she would not have liked hearing it, Kennedy was also frank about what he regarded as an essential element of Israel’s security. It was Israel’s own behaviour towards the Arabs. Of course there would be differences about how to handle certain matters, Kennedy said. He believed, for example, that greater use should be made of the UN in dealing with border problems. (They both knew that Ben-Gurion and Dayan and their fans had nothing but contempt for the UN). The particular action to which Kennedy was referring was the massive Israeli reprisal attack on Syria that had embarrassed the Soviet Union and for which Israel was condemned by the Security Council. Never before had an American President dared to speak so frankly to an Israeli leader. The tragedy was that – because of pork-barrel American politics – it had to be said in private. President Kennedy was so concerned by the possibility of a superpower confrontation being provoked by Israel’s arrogance of power that he saw merit in the idea of the Jewish state being “neutral”, meaning non-aligned. We know that from an off-the-record interview he gave to Amos Elon, Washington correspondent of Ha’aretz, Israel’s daily newspaper for seriously thoughtful people. The interview took place in August 1961 (when Zionist lobby pressure on Kennedy was intense), but it was not published until two days after Kennedy’s assassination. According to Elon, the President said he would be pleased to see a neutral Israel if that would lead to improved relations between the United States and the Soviet Union and, as a consequence, to improved relations between Israel and the Arab world. Golda left her meeting with President Kennedy believing that if Ben-Gurion continued to defy him on Dimona, Israel would be on a confrontation course with him for the remainder of his first term and all of his second; and that, she knew, would be disastrous for the Jewish state and no doubt Jews everywhere. If Ben-Gurion could not be persuaded to change his mind and agree to IAEA inspection of Dimona, he would have to go. In the context above what I am suggesting is that if and when he is free to put real pressure on Israel to be serious about peace with the Palestinians, Obama should make best use of the Kennedy quote – “What we want from Israel arises because our relationship is a two-way street”. And he could and should put flesh on that bone by saying, among other things, that it is not in America’s own best interests to allow Israel to go on denying the Palestinians an acceptable measure of justice. But his crunch point could and should be something like this. “What America wants and needs, in order to best protect its own interests in the Arab and wider Muslim world, is an end to Israel’s denial of an acceptable amount of justice for the Palestinians. Unless we get that, I as president will have no choice but to use the leverage at my disposal to press you.” Israelis would know, even if Obama didn’t spell it out, that the pressure would include an end to American vetoes of Security Council resolutions condemning Israel and sanctions. If Obama was to go public with such a position in the wake of defeat for the Zionist lobby over the Iran nuclear issue, I think it’s reasonable to assume that a big majority of Jewish Americans would signal, if only by their silence and/or refusal to condemn Obama, that their first loyalty was to America not Israel. For those who might believe there is little or no prospect of a Jewish civil war in the event of President Obama insisting with leverage as necessary on Israel making peace with the Palestinians on terms they could accept, I recommend Chapter 12 of Volume Three of the American edition of my book. This chapter is titled The Blood Oath. It reveals that Sharon convened a secret meeting of many senior military officers to sign a blood oath committing them to make common cause with those settlers who would resist “to the death” the implementation of any government decision to withdraw from the West Bank. My named and quoted source for that dramatic story was none other than Ezer Weizman, Israel’s defense minister of the time. The coming months will tell us how mad Netanyahu is. And also whether or not the optimism expressed in this post was justified. If only the world could truly hope for such a lofty resolution to this age-old conflict. But, alas, Zionists are much more clever than you, me and Mr. Obama! Your well-stated reasoning for peace in the Middle East will never happen. Not only are the elitist Zionist leadership more cold, clever and cunning, they also have no conscience. A blood oath is nothing to them. Does the "Samson Option" ring a bell? The only true solution will come about when Jesus Christ returns to rule and reign over all humanity. Hopefully He returns before most of humanity has been exterminated by these mad men! I wish I could be half optimist as Mr. Hart is about the US-Iran deal and any possiblity of Zionist leaders' intention of resolving their occupation of Palestine. Many people believe that like Israel-PLO past "peace negotiation" charade, US-Iran is also a charade to buy time and making some "genuine" excuse to attack Iran to bring-in pro-USrael regime change - as was done in Libya recently. On May 18, 2010, I warned Iranian leaders that the world powers have no intention to accept Iranian position concerning its civilian nuclear program. These powers are putting a trap to disarm Iran’s nuclear capability in order to make its easier for them to invade Iran and bring a pro-western regime change as they did in Iraq, Afghanistan and Libya. I was not much off the mark then. Now after more than three years, Tony Cartalucci, has come to the same conclusion. He says the so-called P5+1 deal with Iran is prelude to war. “The West has no intention of striking any lasting deal with Iran, as nuclear capabilities, even the acquirement of nuclear weapons by Iran was never truly an existential threat to Western nations or their regional partners. The West’s issue with Iran is its sovereignty and its ability to project its interests into spheres traditionally monopolized by the US and UK across the Middle East. Unless Iran plans on turning over its sovereignty and regional influence along with its right to develop and use nuclear technology, betrayal of any “nuclear deal” is all but inevitable, as is the war that is to shortly follow,” he said. “Exposing the duplicity that accompanies Western “efforts” to strike a deal will severely undermine their attempt to then use the deal as leverage to justify military operations against Iran. For Iran and its allies, they must be prepared for war, more so when the West feigns interest in peace. Libya serves as a perfect example of the fate that awaits nations reproached by the West who let down their guard – it literally is a matter of life and death both for leaders, and for nations as a whole,” he said. Regretfully, I share Rehmat's reservations. A US president who does not comply with Israel's whims is a dead president - JFK is a perfect example. 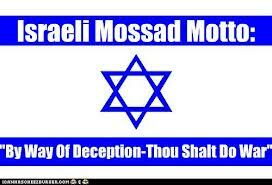 For the present, the most dangerous crime syndicate, aka Israel's godfathers, is in full control of the Western world. Interesting. Since between the crucial years of 1960 and 1988, no President served a full second term, and Clinton in 2000 was the only Democrat to do it since 1940. The historical importance of Camp David in the Summer of 2000, and the subsequent provocations over al-Aqsa cannot be understated, with retrospect. Ehud Barak fought that election with the full intention of losing it to Sharon - who had had given permission to for his visit to al-Aqsa. Barak's only campaign slogan was "The Palestinians do not want peace." Sharon's only campaign slogan was "Sharon will bring peace." And, surprise, surprise, at 11am on the day of 9/11, Ehud Barak was in-studio on BBC World declaring "the world will not be the same after today", "this is an attack on our whole civilisation, our whole way of life" and demanding a global war war on "Terror Thugs" and "Rogue States", which he anticipated would last (very precisely) "six or ten years", and also naming (but not yet blaming) "a Bin Laden type organisation".... And yet not naming Hezzbollah, Hamas, the PLO, PFLP-GC, the IRA, ETA, Tyler Durden and Project Mayhem, the Aryan Nations or any of the more likely suspects that should have sprung to mind. In fact, when a small, obscure Palestinian group DID try, early on in the day, to claim responsibility (claim retracted by 5pm EST)., their claim was almost completely ignored and not taken even remotely seriously. It's actually a valuable Shibboleth amongst the Day of 9/11 Comentators and Pundits to test who did, and who did not possess prior knowledge of what was going on, based on how dismissively or seriously they take the bogus Palestinian claim when interviewed - Madeline Albright, for instance, seems to know exactly what's going on, whereas Sandy Berger is absolutely dumbfounded and quite clearly doesn't have a clue. Would you like to tell your investigative story to Israeli extremist Zionist Jew who makes Netanyahu look like a peace-loving Jew. "It’s now possible that he’ll have the opportunity to become a real peacemaker and go down in history as one of America’s greatest presidents." Obama has trashed the constitution and solidifies US fascism, international law and common human decency, sunk the economy, and killed tens of thousands of people in aggressive war. A 'peacemaker' who has destroyed Libya, and trashed much of Syria? He's a war criminal! Are you even thinking about what you are writing? There is nothing Obama can do to redeem himself from such evil and crimes. "Obama has trashed the constitution and solidifies US fascism, international law and common human decency, sunk the economy, and killed tens of thousands of people in aggressive war. A 'peacemaker' who has destroyed Libya, and trashed much of Syria? He's a war criminal! " Libya was a NATO War, speaheaded by the Anglo-French Axis, desperate to cover up thr ACTUAL crimes of Blair and Sarkozy, from the Lockerbie "trial" to the dodgy deal in the desert, to the DGSE's attempts to depopulate Libya with AIDS, exposed in the Bulgarian nurse's trial. Just as in the case of Kosovo, NATO is an EU dominated military force, not bound by the UN Charter. When the UN Charter was drawn up, supranstional bodies and alliances such as NATO, SEATO and rhe Warsaw Pact are not bound by international wars governing aggressive war, in part because the UN Security Council itself is such an alliance. The NATO action was wrong, but legal. The North Atlantic Council requires a simple majority vote-in-council to go to war. Of 30+ nations, the US gets one vote, and under the terms of the North Atlantic Treaty, such a vote requires member states to express unanimous consent after the vote. Obama could not have opposed the attack on Libya if he tried - He was boxed in by Samantha Power and the Bilderberger Atlanticists - removal of Gaddafi did not benefit the US in any way, it benefits Europe. The Israelis are not the bastards the folks from Veterans Today incessantly write about. This the one area where I hotly disagree with V/T's pool of writers who ENDLESSLY condemn the country as small as the state of Maryland. Which holds the "Occupied Territories" even smaller than adjacent Delaware (next to Maryland). "When the philosopher's argument becomes tedious, complicated, and opaque, it is usually a sign that he is attempting to prove as true to the intellect what is plainly false to common sense." There "ain't no there, there" folks! Support Israel and we will see peace. NATO is composed of nations that are subject to the UN Charter, the Geneva Conventions, and international law, but I'll leave that alone here. The US is, of course, one of the driving forces of NATO, and well in with the rest of the international fascists and war mongering. I will note that Obama and the US was very much involved in supporting the attack on Libya and "regime change", and one indication of that is Secretary Clinton's statement "We came, we saw, he died", referring to Gadaffi's torture, sodomization, and murder. Note the "we". There are many areas where Obama is in violation of human rights and law, and that includes a continual support of Israel's violation of UN decisions regarding Palestine, law, justice, and human rights. DO not look to Obama for doing anything contradictory to the wishes of the international fascist empire, including support for Palestinians, although he may go against Israel if it goes up against the empire. The bottom line is that Palestinians will not get justice from the empire and it's leaders or toadies unless the peoples of the area and the world force the empire to do it, or bring down the empire and international fascists (the "1%" plutocracy and corporations waging class war), from the bottom up -- with few exceptions perhaps, say, from the Global South. Or if Israel itself is brought down from such actions such as BDS or internal revolution. All progress throughout history has been the result of pressure and action by the people. But power trumps law, and this is why the People of the world must seize power. @Spike 1138 - You makes me laugh dude! Qddafi and Liby was destroyed because of Israel and the Jewish Lobby. French Jewish journalist and political activist, Bernard-Henri Levy, was the driving force behind the former French half-Jewish President Nicolas Sarkozy’s war on Libya to remove Qaddafi from power. In November 2011, speaking at the first national convention in Paris, organized by the French Israel Lobby, the Council of Jewish Organization of France, Levy boasted that he lead the anti-Qaddafi campaing because it was a Jewish thing to do. I won't deny that the zionists (nationalists) and other Jewish tribalists have their effect, but Libya has oil, and water (great man-made river), and was messing with the petro-dollar, and was not playing the game according to the empire's wishes. It's also a strategic area for Africom and the Middle East -- part of the grand game. That got the US, with all it's power, against him. Follow the money and the power. Israel is like the empire's attack dog -- but with ambition to control it's master (and some success in that) in the symbiotic relationship, but the driving force in all the world's machinations is money and power more than ideology. Palestine is mostly just a pawn in all this -- but in some situations a pawn can determine the game. Israel is a rook -- and a rook may be sacrificed to win the game -- something Netanyahu and his gangster friends had better realize or they, and Israel, will be destroyed by the real power in the world. Iran (and even Syria), with the Asian pivot and the desire of the US/empire to use it as a tool against the far East, and to set it up for later dominance when they "fail in their obligations" is in a different position than before, and Netanyahu interferes with that at his peril. The danger to the empire, including from Palestine, is that world opinion (the people, not the oligarchy) is in the process of mounting challenges to the empire as the true nature of the situation, and the class war, becomes better understood. "The first program in a two-part series, this broadcast focuses on the growing intersection of Third Reich veterans, Middle Eastern terrorists, European neo-fascists and European ultra-leftists in a new form of international fascism. Particular emphasis is on support by these forces for Libya's Qaddafi, the late Ayatollah Khomeini of Iran and American Muslim leader Louis Farrakhan." Continues the discussion from M-19. Much attention is given to the role of the Third position in staging terrorist incidents to be blamed on the left.